That looks pretty complicated, how do they work? Manual pump somewhere? 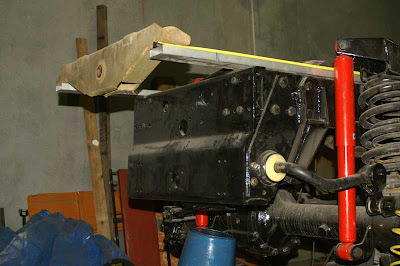 The LMTV and FMTV's have hydraulics on board for the cab lift, spare wheel lift , winch and the suspension pull down. The suspension pull down looks easy enough to operate but too much hassle to set up if you don't already have a hydraulic pump ..... Sorry Iain thought you might have had one. I am considering doing a Mog camper on an ex-army U1700L. 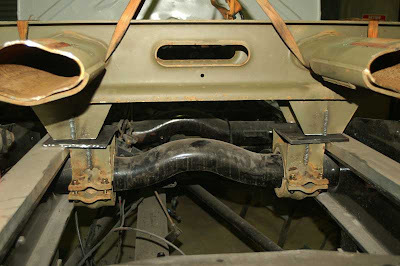 Do you have any photos of one of these trucks showing the tray connection to the mercedes 3 point torsion system. I have looked on the net, yet to find a photo that shows the setup. 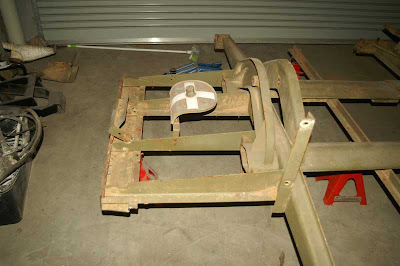 I am thinking of converting a second-hand freezer pan and wondering if I can mount it on the existing tray or remove the tray and put on my own subframe, then build the torsion setup between the subframe and the camper. The mounting system on my truck was from a U1700, I had to cut it down to size. This is the front mount. I cut off the heavy outer member, and made the tray narrower to suit the aluminium sheeting I was using for the cladding, mine is 2,2m wide. Let me know if you need more pics and I'll see what I can find in my records. 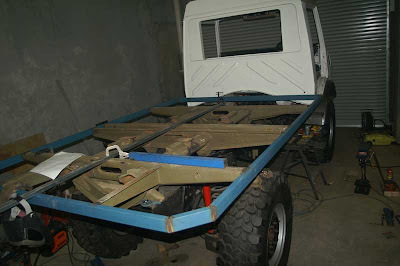 If you get hold of the Unimog Body Builder Handbook, that gives a lot of details on how to mount the four point system. what brand/model crimper did you purchase. Ian how has your side view cameras held up.... well all your cameras for that matter? Would you do anything different from what you know now. Could your side view camera's replace your side view mirrors? Sorry... I admit.. I don't recall where you mounted your side view cameras. All the cameras are working great. They are set up on top of the branch bars, so they show the top corner of the truck as well as the side view. The housings have taken quite a few hits from branches, and have survived. I set them up so I could see if we were going to hit any branches. The also show things next to the truck, but I don't think they could replace the mirrors, as the screens are a bit small, even in single view mode. It would take a much bigger screen than the ones I have for it to be used as a mirror. The road was not that bad, had a few dry mud holes with pretty deep ruts but nothing that would stop a mog, probably why we were able to have this place to ourselves. It crashed on the opposite bank, but we had our boat in the back, so we were able to go on a search and rescue mission. We took the long way out, and discovered the track blocked by a tree, but were able to use our winch to pull the log out the way so we could get past. It was the first time we have used the winch, I made a big of a mess of pulling the log out, making it worse before re-positioning the truck and getting it far enough off the road so we could squeeze through. I'll post a video soon, but I was pretty happy with the winch. It was able drag the truck a bit on the handbrake when fully loaded up. We went through a deeper mud hole, and left a few mog size ruts in it, which means the next people might not make it through as easily. Next trip will be Easter weekend, when we head out to the bottom end of South Australia, 15km up a sandy beach track where we should not have to worry about the crowds. I've followed your posts for years. Thanks for contributing so much to the forum (here and benzworld). Your truck is awesome and one of the reasons we decided to use a SBU for our current expedition truck build. My wife and I have traveled a little in Australia before, but we fantasize about some day shipping our truck over and spending some time really seeing your country. It would be cool to meet up with you some day over there. Our pleasure Michael, look forward to meeting you as well. We bought a gimbal for our GoPro, and it works very well. This is just a short clip on a track next to the Murray River taken in the cab of our truck. Trish has started a Youtube Channel for our videos, we will be adding lots more of the next few weeks.